As an intercultural exchange program, EPRIE aims to promote and improve dialogue between people of neighboring countries in East Asia and Europe, and to support the process of integration in each region. 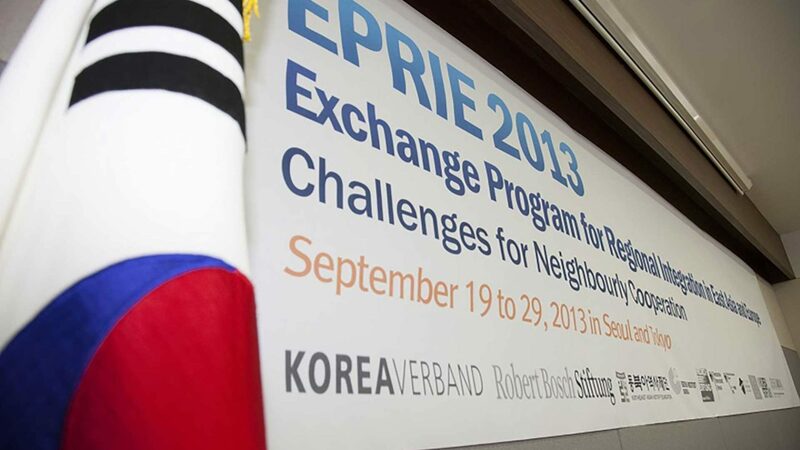 By strengthening transnational relations, EPRIE shall actively contribute toward promoting international understanding. Target groups are young people aged between 25 and 35 years from Europe (mainly France, Germany, Poland) and East Asia (mainly China, Japan, Korea). Program participants will include young professionals, and postgraduate students in Master and Research degrees from the field of Area Studies as well as from the disciplines of History, Social and Communication Sciences, among others. Participants will compare historical developments before and after the Second World War, examine the political and social dimensions of mutual relations, and analyze relevant regional cooperation and challenges. Each topic will be dealt with various perspectives and will be presented with the assistance of specialists from the field of politics, economics, academia and media. In addition, key competencies in intercultural cooperation will be mediated. Through intensive collaborations at the seminar, a network will be created that shall seek to serve long-term cooperation.